Apple launched the Apple Watch Series 3 (GPS + Cellular) on 9th Feb. The GPS version of the Watch Series 3 was launched in Singapore in September 2017. The Apple Watch Series 3 (GPS + Cellular) version can be used while you are on the go. It does not need to be connected to the iPhone all the time. The Apple Watch Series 3 built-in cellular allows you to stay connected. You can receive notifications, answer calls and lots more without actually having the iPhone near at hand. Payments too can be made using Apple Pay with this watch. As of now, the Apple Watch Series 3 (GPS + Cellular) can only be used with the Singtel mobile line. Singtel is offering the NumberShare plan ($6.90 per month) whereby the phone number, data and talktime are shared with the cellular watch. The Apple Watch Series 3 comes in two models, the GPS and the other; the GPS and Cellular version. Both the versions have a 70 percent faster dual-core processor for downloading apps at a faster rate, smoother graphics and allowing the use of Siri through the built-in speaker. Apple Watch Series 3 has a new wireless chip whereby the WiFi speed is enhanced by 85 percent and the Bluetooth and WiFi are more power efficient. The Apple Watch Series 3 will be beneficial to health and fitness enthusiasts. There are coaching features added like water resistance 50 meters and a barometric altimeter to measure relative elevation, outdoor exercises and flights climbed. The Apple Watch Series 3 (GPS + Cellular) has a full LTE and UMTS cellular radio which switches to cellular when the iPhone is not near at hand. The number for the watch and the iPhone will be the same. When the 3rd generation Apple Watch is paired with AirPods, one can enjoy the wireless experience. The display of the watch acts as an antenna to transmit and receive calls for LTE and UMTS, and has an in-built eSIM, little over one-hundredth the size of the regular SIM, so that over-the-air activation is possible without compromise on the space. The Apple Watch Series 3 comes in varied colours and styles. 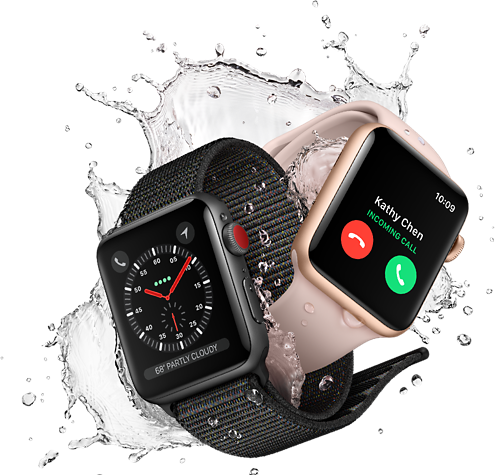 The Apple Watch Series (GPS + Cellular) comes in Grey, gold or silver aluminium or with silver or black stainless steel cases along with various bands. The (GPS) version is available in gold, silver or grey aluminium cases with a Sport Band. They are lightweight and designed to provide a comfortable fit to the wrist. If you want to take your fitness to the next level, stay in good health, be more connected and active, then Apple Watch Series 3 (GPS + Cellular) is the watch for you. It provides smart coaching, has a heart rate app, you can listen to your favourite tunes and also have an interactive Siri experience. It can be used while swimming, can track a casual jog or an intensive workout, track activity levels. All-in-all, the Apple Watch Series (GPS + Cellular) makes your body your main priority. The Apple Watch Series 3 (GPS + Cellular) comes at a price of $598. What Can We Expect From Samsung Galaxy S9?